Naturally Sweet Sisters: Parents and Teens - Thinking about Insulin Pump Therapy or CGM? Check This Out! Parents and Teens - Thinking about Insulin Pump Therapy or CGM? Check This Out! Through the years post diagnosis of our Naturally Sweet Sisters, many families have asked how we decided to start insulin pump therapy. My answer is relatively simple. Since our little one was just a hair over three years old (37 months to be exact), I made the decision. It was difficult enough to decipher toddler eating habits and even worse to try to measure a 1/4 of a unit of insulin on a teeny-tiny syringe. Just a few months post diagnosis and I was promptly asking (demanding) a shiny new pink pump. That same decision can be more complicated when it comes to teens. Whether the teen is years post diagnosis or newly entering the world of T1D, the decision to try insulin pump therapy (or CGM) becomes a three-way partnership between teen, parent/caregiver and provider. A few weeks ago, our friend and researcher, Dr. Tim Wysocki and I shared a conversation about a new research opportunity for teens (ages 11 - 17) that have been diagnosed with T1D for at least one year or 6 months if HbA1c > 7.5%. The study includes a mix of randomly assigned teens to either be assigned to usual clinical practices OR take part in using a web-based "decision aids" that guide families to carefully consider decisions about insulin pumps and CGMS - using information from similar teens and other families. To me, this is the way of the future - teaming up to utilize information from peers to help make real, practical and educated decisions about chronic care. Shouldn't we stay with what we know? Too many choices to decide, so maybe I should do nothing? 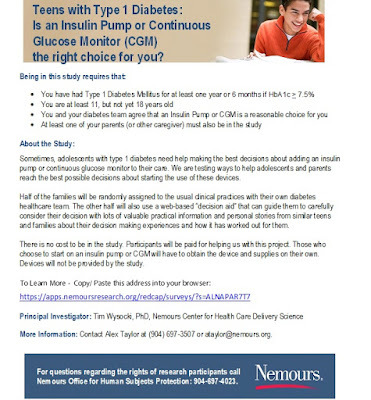 Than think about joining the research study led by Dr. Tim Wysocki, PhD, Nemours Center for Health Care Delivery Services, called "Teens with Type 1 Diabetes: Is an Insulin Pump or Continuous Glucose Monitor (CGM) the right choice for you?" You may also contact Alex Taylor at (904) 697-3507 or ataylor@nemours.org to have additional questions answered. Oh and as a bonus, there is compensation available for participation in this research study, which if you ask my daughters, is a nice perk for any teen that loves shopping! Don't forget to follow @Natsweetsisters on Twitter for information and news on the latest research for T1D!